Dala Craft Paint can be used for most craft and art projects, on a variety of surfaces, including hard and soft wood, paper, cardboard, cement and unglazed ceramic, polystyrene and clay. It can also be used effectively on traditionally more difficult surfaces such as plastic glass, wax and tin – as long as the surface is first covered with Universal Undercoat. All the colours dry to a durable satin finish. Built in UV protection means that the paint can be used in- and outdoors. The range is available in a large variety of colours, divided into three categories – basic, metallic and neon. Dala Craft Liners ad further creative options. Fiamalite shapes in a variety of sizes. Push the kebab sticks through the Polystyrene balls. 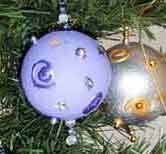 Paint the balls with Dala Craft Paint. Allow to dry for 2 – 3 hours. 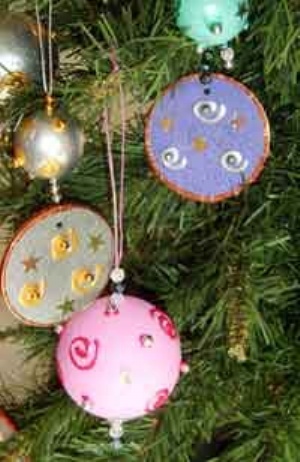 Use the Dala Craft Liner to draw patters onto the polystyrene balls. Beads and stars can be pressed onto the wet Liner, to create further interesting patterns. Allow to dry for 2 – 3 hours. Sponge Liner onto the perspex disks to create a ‘cloudy’ pattern. Allow to dry for 2 – 3 hours. Make a small knot at the end of the string or fishing line. The length will depend on the size of the ball – approximately twice the diameter of the ball. String five beads and push the string through the hole in the polystyrene ball. String another bead on top of the ball and knot. Make a loop in the piece of string, sticking out above the ball and hang on the tree. The perspex disks can be strung with the balls in the same way. Make a small hole in the disks with a sharp object and string – as described above. This item has 658 views.